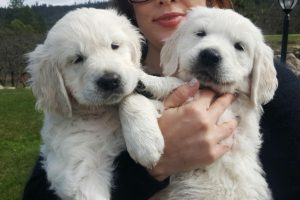 Have you ever wondered when English Cream Golden Retriever puppies open their eyes? Or when they start walking? When do they wag their tale? Or how about when the best time is to start potty training?? We always enjoy watching out litters grow into happy healthy puppies and put together a few fun facts about the stages your puppy will go through during the first weeks living with Hill Haven Kennel and with you after you take your cuddly new little retriever home…. During this first week, the puppies don’t do a whole lot except eat and sleep and eat and sleep and then eat a little more!! They are pretty quiet but if they are hungry and can’t find Momma, be prepared to hear a little yelping! This week is pretty exciting… The puppies start opening their eyes, wagging their tales, sniffing new smells and army crawling all around the whelping box. Their ears are also developing so they can now hear their litter mates and mom, their little personalities will start to show through as well. Get ready for puppy to take their first steps this week! They will learn a little bit of independence and play with their sisters and brothers. They might even find a taste of Mom’s food to use those first teeth popping through on! The 4th week is kind of a big week. Mom will start weaning the puppies which means puppy food for puppies! She will even start teaching them a few manners! Socialization is starting to be key for the development of life this week as they will continue to learn how to play and interact with both litter mates and humans. These weeks are just a lot of playing, investigating, teaching respect and learning to be a family. 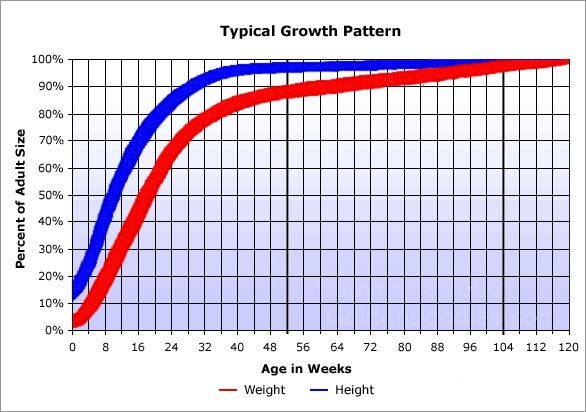 Puppies should have all of their teeth by the end of their 6th week. Potty training can start during week 7!! At some point during these 4-weeks puppies will go to their forever homes. During these weeks your puppy will start a faze of being afraid of everything. This is where you will need to do your part to assure puppy that he’s safe and that the broom isn’t going to attack him! They will start having more control over their bowel movements and maybe even start sleeping through the night… Yay! This is a perfect time to start getting serious about potty training. Your puppy will even be able to learn a few commands such as – come, sit, stay… You might even try leash training during this time. The things you teach your dog through these crazy weeks will stay with him forever so stick with it, you can do it!! Chew, Chew, Chew… That’s all your puppy will want to do during this time. Big dog teeth will be coming in as puppy teeth fall out, be sure to have plenty of toys around and hide your shoes! This is also a time when your puppy will test your authority these 3 months… growling and nipping will occur, show him whose boss and that you’re the leader of the pack! We are currently expecting a Summer 2017 litter! Please consider one of our amazing, gentle English Retriever puppies for your next family friend. Send us an email if you have any questions either about raising a puppy or purchasing one of ours!